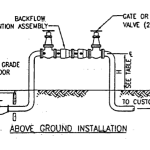 Backflow assembly is another name for backflow preventer. They prevent contamination from entering our drinking water supply. All Backflow assemblies must be tested annually by a registered certified backflow tester. City Backflow Testing is licensed with the state of Texas and registered in thet Dallas Fort Worth metroplex.